If you love collecting mobile phones with dual SIM maybe you will change your mind today because Cherry Mobile offers the newest and the first Triple SIM mobile in the country. 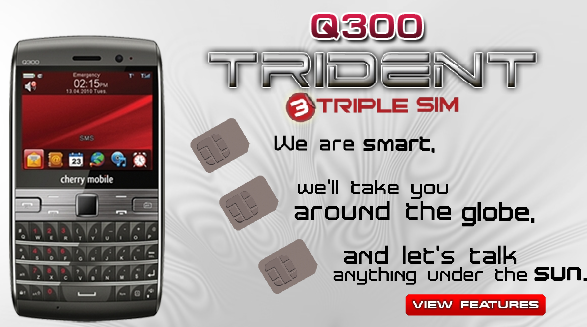 The Cherry Mobile Trident Q300 is can cater up to 3 SIM together with TV, Wifi, Bluetooth, G-Sensor, supports 4GB SD, and a lot more. 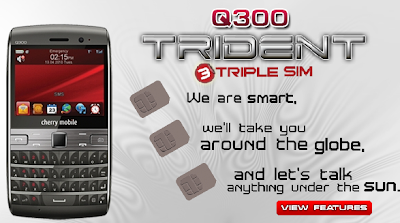 Cherry Mobile Trident Q300 is now available in selected stores nationwide with price range to PhP 6,500 to PhP 7000 only.